Double the comfort and lightness. For any terrain and surface. Powertwin Pro is a great two-seater designed to enjoy and learn from nature. With its revolving wheel and disc brake, this genuine all-terrain vehicle is very safe out in the open country. It is lightweight, compact, and has the best push and steering in its class. Large capacity shopping basket with easy access. 360° lockable front swivel wheel with powerful front disc brake controlled from the handlebar. Convenient and also optimizes control when pushed over difficult ground. Pushchairs seats suitable from 6 months to toddler (30kg, 15 + 15 kg), or from birth when used with the Koos infant car seat(s). PU tyres: New resistant puncture proof polyurethane tyres. Two hoods with UV50+ protection, raincover. Easy Folding - Superior compact folding, 96x61x49cm or 87x46x35cm with wheels removed. Weight: 14.7kg, (Chassis 11.7kg with wheels removed). I haven't actually used this yet as my twins havnt arrived but after setting it up (attaching wheels and hoods,which was simple) I have to say this buggy is definately worth the money.I was concerned buying a twin buggy about it looking like a train but was pleasantly suprised with this one.it does feel heavy but I am in late stages of a twin pregnancy.its lovely and sturdy and looks brilliant.although it seem heavy it does seem very smooth and easy to push.I hope I get many years out of it. Oh also the ad doesn't state this but you actually get a pump for the wheels incase they deflated,its hidden in the basket. Good this helps people as I noticed no one had reviewed. Wow my lovely shiny new wonderful Jane powertwin pro arrived yesterday....wow what a fabulous pushchair. I am a self confessed pushchair addict but finally i think i have found all the things i require in this most fantastic model. Handle's like a dream,my little girls of 2 and 1 both finally look comfortable,can both have a snooze as the front seat reclines ( that is a god send) and bonus i can take it round small shops one handed whilst holding a shopping basket ( that was full i might add) without struggling at all. I would highly recommend this marvellous pushchair to anyone who needs a twin stroller. Also true bargain of a price have seen the same model elsewhere for a hell of alot more. So all round one extremely happy customer. It's very lightweight compared to the other double pushchairs I tried when I was expecting. Front seat reclines enough to let a toddler sleep comfortably. Quite compact for a tandem once your baby can sit properly in the back. 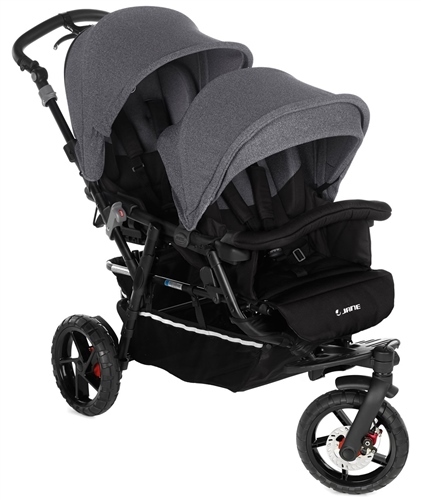 Can be used with an infant carrier to make a travel system for a baby and toddler on the front or back seat and with two infant carriers to make it suitable for twins. The hand brake. A couple of people have had a chuckle about this asking me when i would ever need a disk brake on a pushchair however i have to say for me it is actually a godsend. Living somewhere that is supposedly flat (norfolk) i have a surprising amount of hills near my house...I grant you that they are not mountains but when you load up two small kids and all thier kit into a pushchair thats never going to be as light as a single (and then you add onto that another baby bump) you will silently thank whoever put it there. It saves me jogging after a front heavy pram - that is far too much like strenuous exercise.